Beachy materials and a painting by Robert Spellman set a regal tone by the shore. For product information, click on icon at bottom left of the image. Pale textural elements unite the living room and the master bedroom. One of six private residences on the Dunmore’s grounds, the U-shaped house was built by the Miami firm de la Guardia Victoria Architects & Urbanists. 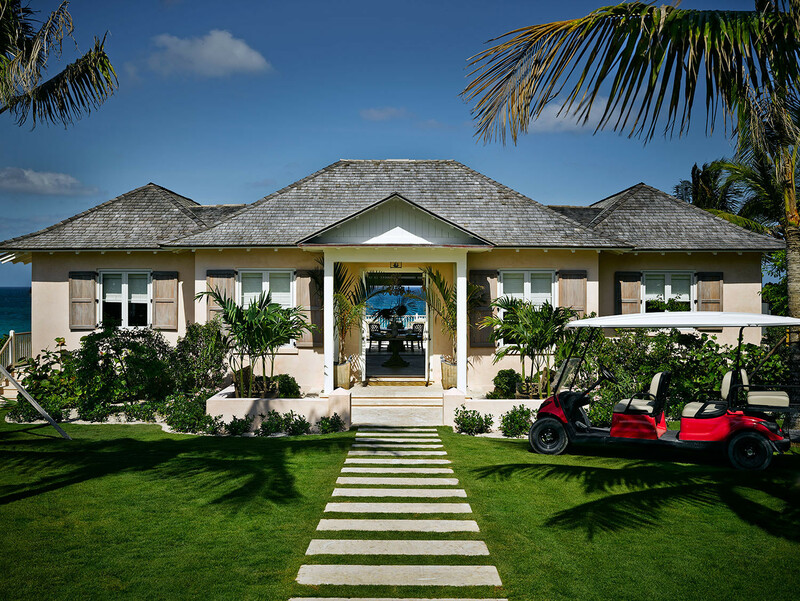 Situated directly on Pink Sands Beach, the two-story, four-bedroom structure emphasizes indoor-outdoor flow, with the living room opening to a stone terrace with fully retractable Nano doors. Branca began working on the project in April 2013. “There was a huge simpatico,” she says of her relationship with her clients. “A good home comes from a great relationship. You get what you put into it.” The owners had children in their 20s, the same ages as Branca’s own, and wanted a retreat that was equally suited to family time and socializing. 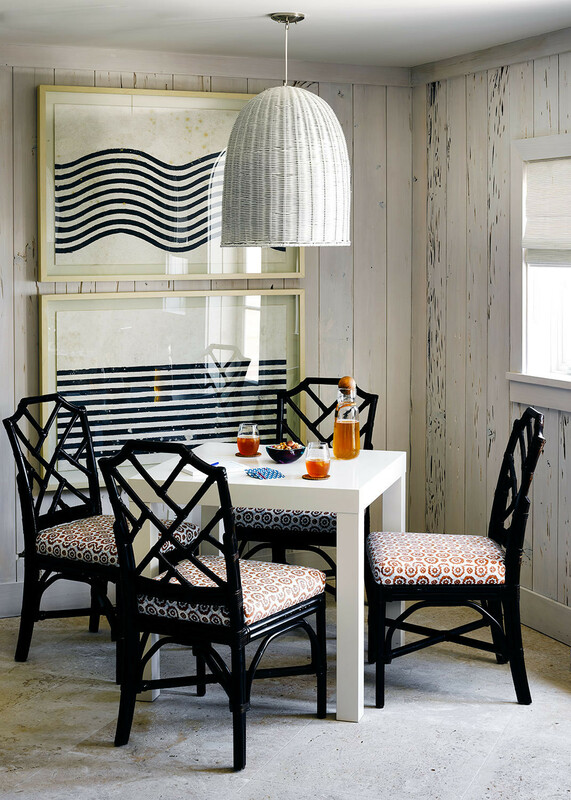 Thus the first step in the design process—“You sit down and talk about how a client wants to live there,” Branca says—yielded an easily translatable version of the designer’s own tropical interiors. She chose similar driftwood-like panels for the walls of the couple’s living room, as well as a deep pinkish-red hue and built-in shelves for the bar. The ocean-facing facade, clad in a blush pink that complements the surrounding tropical hues. 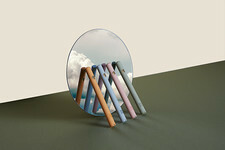 A casual table for four with a nautical air. 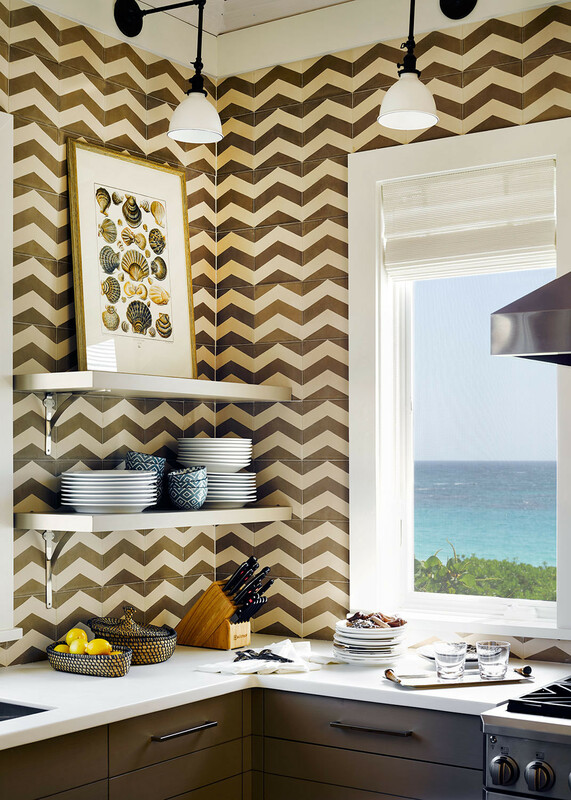 Chevron wall tile sets off the kitchen's open shelving. The owners are wonderful, chic, joyful, and kind; they laugh a lot, and it shows. 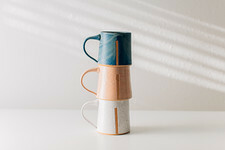 With the exception of a few spaces, including the chevron-tiled kitchen and the living area’s textural white walls, Branca suffused the rooms with her trademark saturated hues. 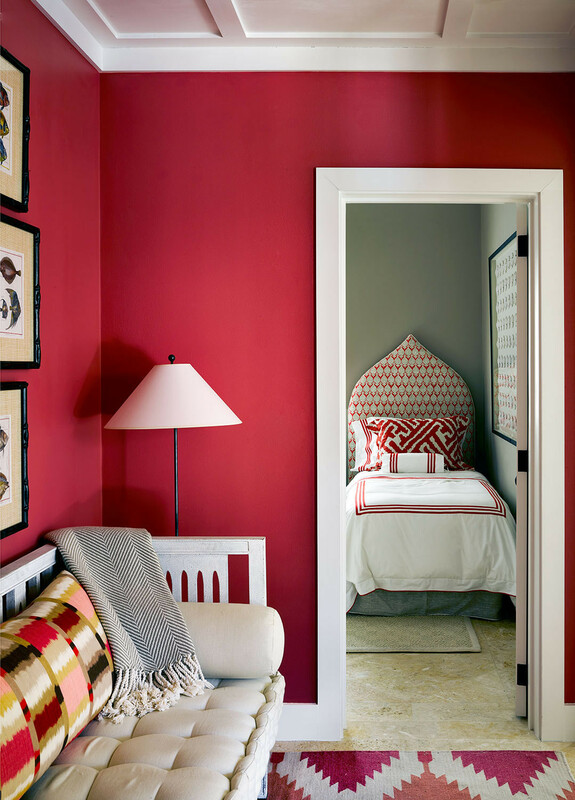 A hallway is painted deep sea-blue; persimmon-red punctuates a guest room. The relationship of color to place is a major consideration for the designer, who has homed in on a preferred Harbour Island palette just as she’s done for interiors from Italy to Arizona. The trick, she says, is all in the light—which is in no short supply in this part of the world. “Yellow doesn’t do well in the tropics, it’s too hot a color,” says Branca. “In Capri, a deep, yolky yellow works well with that incredible bright blue because the ocean looks navy instead of turquoise.” Certain shades, she insists, highlight Harbour Island’s waters particularly well, including the ultra-pale pink she chose for the beach-facing facade. “We painted the courtyard that blush hue because we wanted to warm up the color that came off the ocean,” she says. Vibrant color and pattern are true marks of a Branca residence. 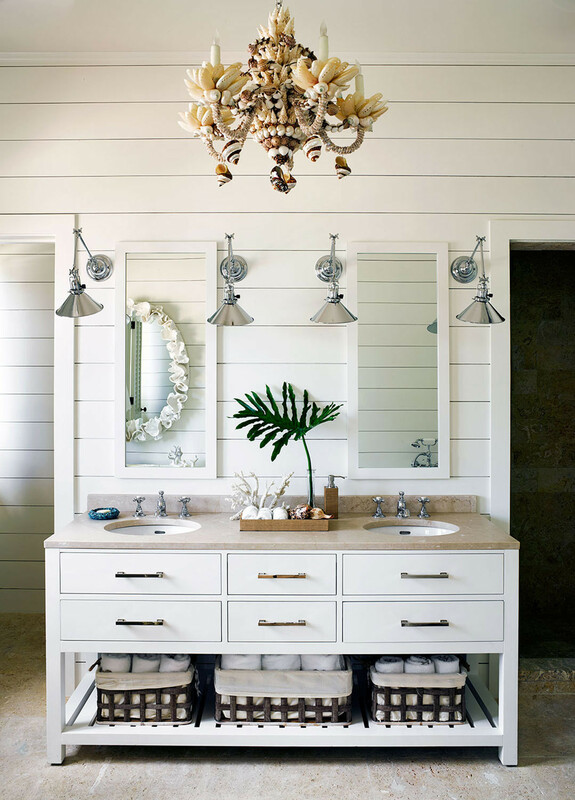 A shell chandelier looks apropos in this otherwise subtle bath.